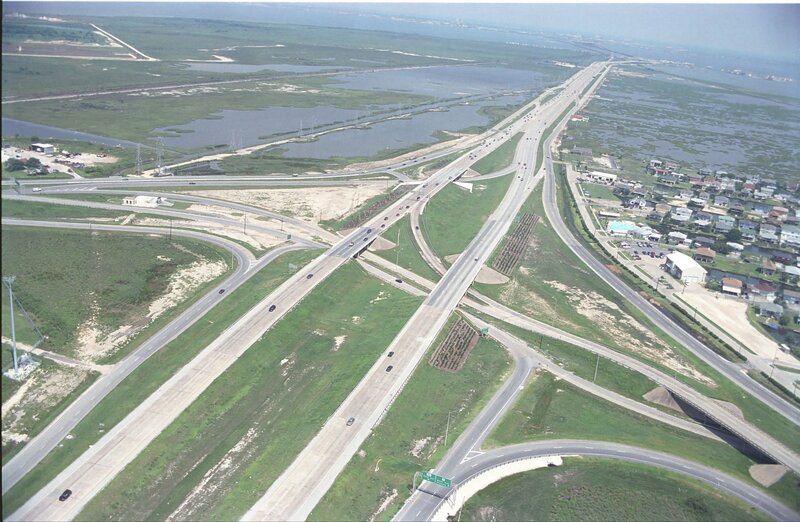 Aerial photos are courtesy of the Texas Tranportation Institute, Jim Lyle staff photographer. Aerial photos taken in June 2001. Ground level views taken on January 12, 2002. 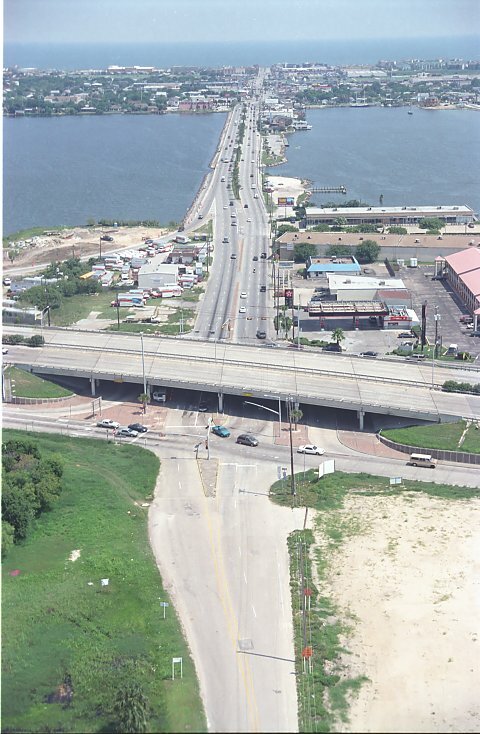 The Galveston Causeway was completed in its present configuration on April 29, 1964. There are plans to replace both spans with new a 8 lane facility. That work could begin as soon as 2003, but will probably be delayed. (high resolution 340k) A. Looking northwest along the IH-45 corridor at the Texas City Y. Highway 6 forks off to the left, and highway 146 forks to the right. (high resolution 527k) B. 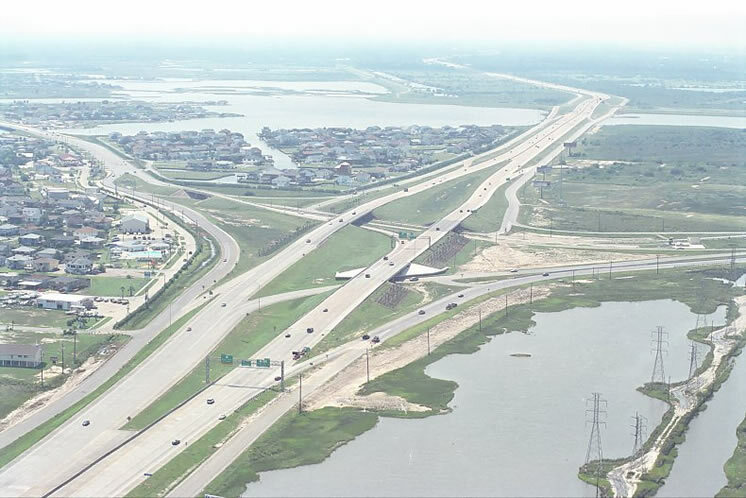 Looking southeast along the IH-45 corridor at the Texas City Y.
C. Driver's view approaching the causeway from Galveston Island. 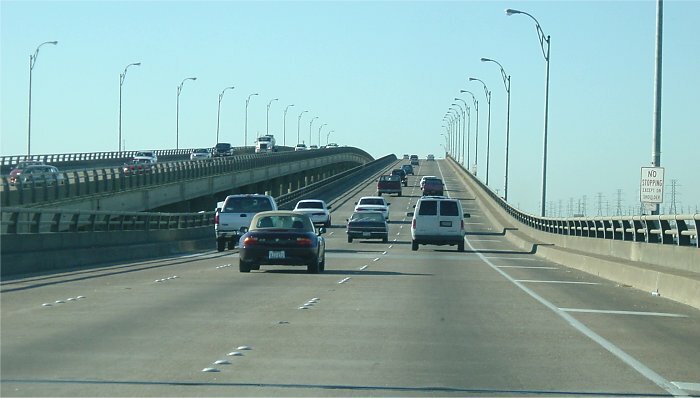 C. Driver's view on the causeway proceeding northbound. (high resolution 194k) D. Looking northwest along the IH-45 corridor. 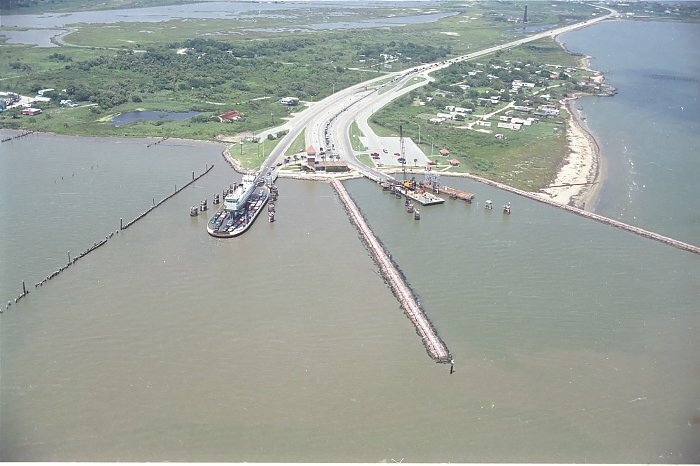 E. Aerial view of the intracoastal crossing. The railroad drawbridge stays open, and closes only when trains cross. F. The railroad crossing was also the vehicular crossing between 1912 and 1938. This view shows the roadway on the bridge. 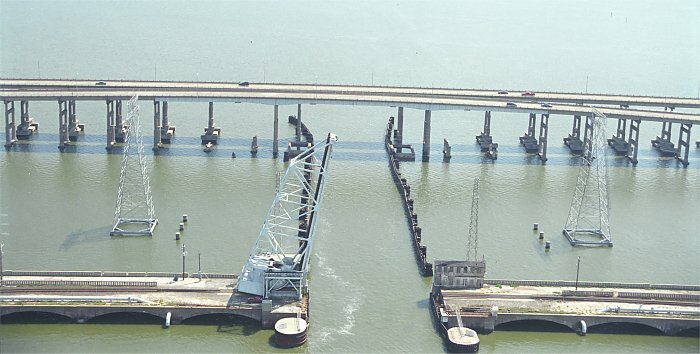 The original 1912 vehicular bridge was heavily damaged by the 1915 hurricane, and most of today's structure was the result of rebuilding that was completed in 1922. G. The old and new bridges. (high resolution 342k) I. Looking south along 61st Street. In the foreground is Interstate 45. The body of water in the midrange is Offatts Bayou, which really isn't a bayou at all. In the distance, Galveston Island and the Gulf of Mexico. J. 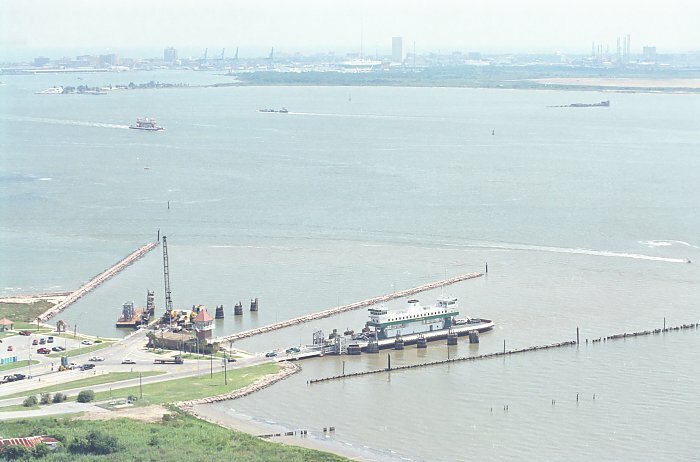 The Bolivar Ferry does not connect to Interstate 45. However, this crossing is now under consideration for a new toll bridge. 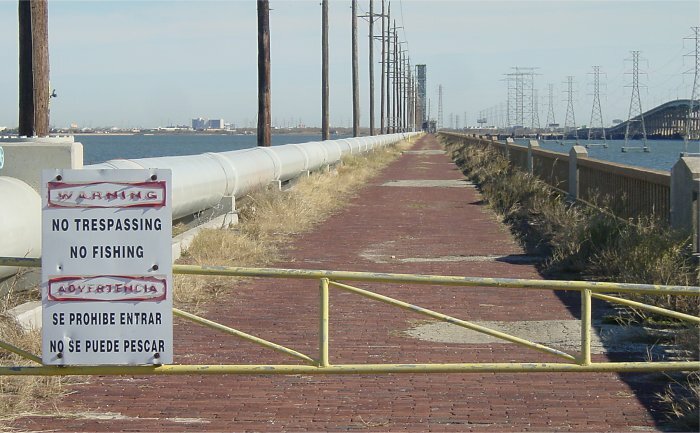 This view is the ferry terminal on the Bolivar side. K. Another view of the Bolivar ferry terminal.